Honeywell - MN12CES : Portable Air Conditioner Review • The Air Geeks, reviews of air conditioners, dehumidifiers and air purifiers. It’s hot outside, hot inside, and you can’t wait to breathe again in your house? Well well, here comes Honeywell! 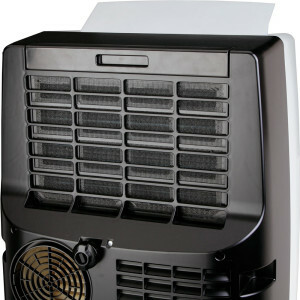 The MN12CES is a sleek air conditioner that offers a cooling capacity of 12K BTU. This powerful unit is specially optimized for a 450 square feet space. In addition, it offers dehumidification functionality that comes in handy when there is need to reduce the amount of moisture in the air. Moreover, this system is quiet and it is suitable for users who want cool and silent environment. In case you are looking for a powerful air conditioner for your house and you have not yet settled on the type, then you should consider this system for your cooling needs. The Air Geeks give you the good, the bad and the ugly about the MN12CES. To start with, the MN12CES is engineered to offer an impressive cooling capacity of 12,000 BTU. With this capacity, it is an ideal air conditioner for a wide range of uses including cooling in living rooms, computer labs, server rooms, and classrooms to name a few. According to the manufacturer, this unit is an ideal solution for spaces as large as 400 square feet. What we found in our test is that in real life, that figure is closer to 300 sq ft. But remember, the effectiveness of this system can be greatly affected by the design of the house especially large openings and ventilations. A portable air conditioner does not require permanent installation and it is therefore suitable for people who have plans of moving the unit from one position to another. This air conditioner features castor wheels for easy pushing from one room to another depending on the user’s needs. In addition, this portable system is compact : it measures 15.7 by 16.5 by 29.3 inches and weighs 68.3 pounds – a nice size when some competitors weigh 100 pounds. The MN12CES air conditioner is based on a highly effective no-drip design and does feature a bucket. This unit employs an auto-evaporation system that ensures that the condensate is recycled to cool the air. The dehumidification capacity of this air conditioner is 70 pints/ 24 hours. Another impressive design feature of this air conditioner is its 3-in-1 technology that enables you to enjoy three functionalities from a single system. It is engineered to offer cooling, fanning, and dehumidification. This design makes this air conditioner an ideal choice for use in areas that experience weather fluctuations. It is always important to consider the user interface of any device before purchasing it. This air conditioner features feather touch controls and an LCD display. In addition, it comes with a remote control that enables users to adjust various settings, and choosing one of its 3 speeds, from anywhere within the room. This unit features an automatic shutoff timer that enables users to set when the system should deactivate automatically. The MN12CES air conditioner comes with a window venting kit. The way this window vent is designed enables users to install it with ease. In addition, this window vent can fit on any standard window without any need for modifications. This window vent is non-permanent and the user can remove it when the system is not in use. Some air conditioners are noisy and therefore not suitable for use in some places. This portable unit is designed to run quietly and with little disturbances. Its maximum noise level is 55dB. However, our tests showed a higher level of noise than expected, which is not too loud to be in the same room, but still bothers the users. It is designed to use an environmentally friendly R410A refrigerant. It offers a powerful air flow of 163 CFM. Efficient cooling. Will take the temperature down from 80 to 70 in two to three hours. Three functions for the price of one. This system offer three functionalities: cooling, dehumidification, and fanning. Many users, especially those who live in areas that experience weather fluctuations, are greatly impressed by this design. Smart auto-evaporation system. This system eliminates the need for emptying water from the unit. We also like the remote control, definitely a plus. Loud operations. Hey, this is expected for a portable AC unit – but we feel that the manufacturer could have made the unit quieter than it is. This Honeywell Portable Air conditioner had exceeded my expectations. When I was looking to buy a new portable air conditioner I did a lot of research to find a good one. 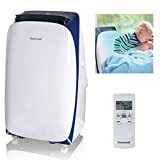 I couldn't find very much information on Honeywell Portable air conditioners but I knew that Honeywell has a good reputation in other categories of appliances. I decided to go for this Honeywell portable air conditioner and I am so glad that I did! It worked really well throughout the entire summer. We had some really hot days and this air conditioner always provided releif and the portability is really convenient. The other nice feature is that when the unit is not being used you can take the exhaust pipe out of the window for when its cold out, or for security so that you can lock your window. The performance of this unit was really above my expectations. It cooled our Kitchen, Livingroom, Dining Room and a large hallway! It also looks much sleeker than other units, and it's quieter than our previous unit. I would recommend this unit for anyone in the market for a portable air conditioner." Fast easy setup for IQ over 60; doesn't make too much noise, unless you're used to living in the forest atop a great mountain in eternal winter; blows cold air forcefully; keeps my 450 sq ft, 11 ft ceiling Brooklyn studio at 72-74 in 90 degree heat. Looks great, seals the deal on all my dates, getting engaged as a result of this unit. Buy it, stick the hose in the window, plug it in, turn it on, and recreate the Little Ice Age while you await armageddon." The Honeywell MN12CES air conditioner is a powerful system that offers fast cooling within a short time. It is based on a three-in-one design and offers three functionalities. With a cooling capacity of 12,000 BTU, the system is suitable for a 400 square feet space. Despite its impressive features, we’re concerned with the noise level as this is definitely not a silent model. By considering both the advantages and the limitations of this system, it is fair to give it a high rating.